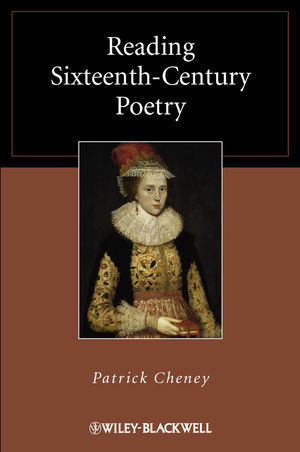 Reading Sixteenth-Century Poetry combines close readings of individual poems with a critical consideration of the historical context in which they were written. Informative and original, this book has been carefully designed to enable readers to understand, enjoy, and be inspired by sixteenth-century poetry. Patrick Cheney is Distinguished Professor of English and Comparative Literature at Penn State University. He is the author of books on Shakespeare, Marlowe, and Spenser, most recently Shakespeare’s Literary Authorship (2008) and Marlowe’s Republican Authorship: Lucan, Liberty, and the Sublime (2009). He has also edited Cambridge Companions to Marlowe and Shakespeare’s Poetry, co-edited Oxford Companions to early modern English poetry and drama, and co-edited an Oxford edition of Marlowe’s poems. Currently, he serves as a General Editor of The Oxford Edition of the Collected Works of Edmund Spenser. The Pleasures and Uses of Sixteenth-Century Poetry. Part I 1500–1558. Reading Early Tudor Poetry: Henrician, Edwardian, Marian. The Poetic Style of Character: Plain and Eloquent Speaking. The Crisis of the Reformation, or, What the Poet Sees: Self, Beloved, God. The Poet’s Ecology of Place: Sky, Sea, Soil. The Idea of a Poem: Elegy, Pastoral, Sonnet, Satire, Epic. The Role of the Poet in Society: Skelton, Wyatt, and Surrey. Part II 1558–1600. Reading Elizabethan Poetry. The Poetic Style of Character: From Plain Eloquence to the Metaphysical Sublime. What the Poet Sees, and the Advent of Modern Personage: Desire, Idolatry, Transport, Partnership. The Poet’s Ecology of Place: Cosmos, Colony, Country. Fictions of Poetic Kind: Pastoral, Sonnet, Epic, Minor Epic, Hymn. The Role of the Poet in Society: Whitney, Spenser, and Marlowe. Part III A Special Case. 11 Shakespeare: Voice, Perception, World, Form, Career. Retrospective Poetry: Donne and the End of Sixteenth-Century Poetry.